Sometimes it seems like the best solution is just to “get by”: to produce a violin vibrato that doesn’t intrude on the sound, doesn’t mess up the pitch, and doesn’t tire out your arm in the process. That way nobody can complain, right? But that doesn’t mean it can’t also be a beautiful, distinctive feature of your playing! The key is flexibility: flexibility of speed and width, all while decorating the pitch rather than distracting from it. My favorite exercises for developing and maintaining that flexibility come from the Simon Fischer book, Warming Up. But I have found that many people need help understanding the four specific exercises that Fischer describes in the text. I’ve seen some interesting interpretations, some of which I fear won’t bring about the desired results! So I made a video showing how I use Fischer’s vibrato exercises. In the end, the four motions combine for some rhythm practice with the metronome. If you do these exercises daily, you’ll find that your vibrato starts more easily, passes from finger to finger, and adapts to different tempi and characters. In a word, effortless! Thank you for your helpful writings etc. on violin. I am subscribed for your newsletter already, but I cannot locate my username and password to access the members’ area of your website. I tried twice earlier this week to sign up, but no email ever appeared with a password. I hope you can help me with this. Thanks again for what you do – I’ve shared your website and newsletters with my students and friends. Hi Dessie! Sorry about that. Do you mean that you tried the “Forgot Password” link but you never got an email to help you reset it? Thanks Nate, like and will try steps 1,2,3 put 4 seems like it might confuse the arm vibrato motion my teacher has been showing me. Well, part of Simon Fischer’s rationale is that every vibrato can use elements that come from arm, hand, finger, etc. But any of these motions that you practice will build flexibility and awareness! Do the ones that you can now, and you can always visit the rest later. Thanks for the explanation, Simon Fischer’s comment on the vibrato motion of forward, forward, had me at a loss of what he was trying to convey with just words. Thanks Nate! I’ve been playing with these ideas all day . . . the idea of UP has already put more energy and control in my vibrato. Long term, I think it will address the left hand tension issues that have plagued me. Thank you again! I disagree with what you said about the sliding vibrato. One of the greatest and most famous violinists of our generation, Anna Karkowska, uses this style of vibrato to hauntingly beautiful effect. I believe her vibrato was clocked to be far faster than the second place winner of fastest vibrato speed, that of Jascha Heifetz, and at a rate of Mach 5, it was five times faster than the speed of sound. You could see it before you could hear it, but the sonic effect, once heard, could fell trees upon impact. Haha! I believe I can feel her vibrato through the screen! How did you know I was doing an imitation of her when I demonstrated that technique? Can anyone translate? Google is stuck on the word “thetach”! Hi Nathan. I would like to comment one thing about vibrato that all professional violinist have been misunderstanding during years and years. The vibrato modifies the pitch up and down. Vibrato, definitely, is not below the pitch. You need a software called intonia to see it. You can record any violinist and you can verify that his vibrato goes up and down the note. The software is cheap. Here you can see some examples of great violinist. Press “Heifetz Plays Vitali” to see Heifetz’s vibrato. Each white line is a note. Pitches above the line (sharp) are showed in red colour and in blue the flat notes. Enjoy! PS: I highly recommend this sofware to analize playing. Is designed for string instruments. Hi Raúl, and thank you for this link. I just played for a few minutes with the software, and so far you’re absolutely right! I pulled up the Heifetz opening to the Bruch concerto to test. This may be one of those pieces of wisdom that’s useful for producing the result (I certainly have found it useful) while actually being wrong! Now, Heifetz did have the reputation for riding just above the orchestra’s pitch, so could it be that the top of his vibrato produced that effect? Nevertheless, I didn’t expect it to be so evenly distributed on both sides of the line. When I have more time I would like to record myself the same way. Hi Nathan, I’m happy you find it useful. I’m only an amateur violinist, but I have analized the vibrato of most great violinist (Perlman, Milstein, Julia Fischer etc) and it is always the same: vibrato is above and below the pitch. I don’t know why great violin pedagogues don’t know that fact. The software is also great to check that no violinist play in tune, I mean 100% in tune. Thanks so much for putting together this video. I’ve heard many of the concepts before, but your explanations and demos got a lot of it to “click” for me. 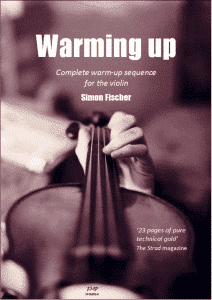 I’ve started incorporating the Simon Fischer warmup exercises into my warmup, and even after just a few days, I notice a difference in my vibrato. Great video thanks! As you play without a shoulder rest, when you vibrate does your hand still hold/touch the violin neck with the (first finger) side of your hand? Does the thumb offer more support underneath the neck? Or does a sufficiently relaxed hand allow it all to move even while touching? I am playing without a rest now (much better on the neck) but struggling with vibrato. It is worse on the viola with the added weight! Generally it does touch with the first finger: one of the three “points of contact” (thumb, finger, collarbone). On occasion, if I need a wider or more free vibrato, the thumb alone will support the instrument but that is the exception. A “soft” hand that doesn’t squeeze should allow sufficient movement for a normal vibrato even when the first finger contacts. I imagine the viola is more cumbersome! At least you aren’t dealing with the additional weight of the rest as well! Nathan, I do have Simon’s book and did review your videos in detail. After trying the motions the way you explain them for several days it’s rather unclear from my standpoint on how to produce these motions (nail joint, rolling finger) without using the concept of arm or wrist motion, the way vibrato is traditionally thought. The exception is the “sideways” motion away from the neck, and I’m completely baffled by this. In fact, when I work with students at the early stage of vibrato, they sometimes attempt this type of lateral motion, but to no good effect. In short, aren’t these motions really the result of an impulse from the arm or wrist, perhaps adding in a touch of “finger” vibrato? Thanks for this deeply granular look at vibrato! Hi Bill, sorry to have missed your comment before! You’re right of course. Any vibrato worth its salt will involve the hand, wrist, arm, in some combination. What I love about Simon’s approach is that it focuses on the finger as the end result: the thing you’re actually trying to get at. I’ve seen it demystify the process for many students (and even professionals)! But the old ways survive for good reasons too. If they make more sense and bring better results, by all means stick with them. Likely your end result will be the same. As for the lateral motion (number 3), it’s very subtle in the “finished” vibrato. But there are side benefits to practicing that motion in rhythms, I believe (increased flexibility, softness of the hand). Nathan – Thanks for that clarification. Looking again at #3, the lateral motion, I’m finding it’s a bit easier to get that motion started with the violin in “guitar” position and the scroll high. And yes, now I can see how that is subtly part of a finished vibrato, especially in an arm vibrato motion. The more I look at this, I find there are many, many moving parts in a great vibrato, and the real job is to avoid impeding any of that motion. Watching Milstein, I noticed his vibrato tended to originate from the arm, as it seems to from you as well. Is this my imagination? I ask because I am in the process of developing vibrato and I practice both motions. Milstein, like all the greats, used a combination and changed it as it suited him. But you’re right that compared to some others, there is less obvious motion at the wrist. It’s all about whatever combination is going to get things moving where it counts: at the fingertip! It can be hard to tell where the motion starts, sometimes even for the player himself. But as long as you keep the flexibility of the finger in the front of your mind, you’ll find what works for you. Hi Nathan, I have like many others struggled learning vibrato. I have seen your videos, i have a couple of Simon Fischers books. When I read Simon Fishers up, up, I get confused, does he mean towards the scroll or towards the bridge. I guess most violinist and their teachers do not know anatomy and biomechanics and that’s why there is som many “good” advices concerning the learning of vibrato. I therefore analyzed what the finger, the wrist and the forearm does i the vibrato. I am an amateur violinist but also a medical doctor. When you look at the hand from a biomechanical point of view it is in the most relaxed position with the knuckles and the fingerjoints a little flexed. This is the hand shape you want as playing position on the fingerboard. If you want to change this shape and straighten the distal finger joint as you want in vibrato, you have to make an active movement of the hand towards the scroll by making a dorsal flex i the wrist. When you stop the movement and relax, the finger and the the hand makes a passive movement back to the relaxed hand shape because of the elastic properties of muscles and tendons. The thumb is rotating around it axis going clockwise when the hand move towards the scroll and counterclockwise when the hand goes back to its relaxed position. You can with this method vibrate without effort and in full control of speed and width. You can make “arm” vibrato in the same manner, you make the wrist movement lesser and rotate more in the forearm. Even “finger” vibrato is easy, just smaller movement i arm and wrist. I my opinion there is only one way to make vibrato, but you can “tune” it by how much arm and wrist contibute to the movement. Try it. Hi, and thanks for the detailed note! I agree that my fingers are relaxed when a little flexed. The question is whether the vibrato motion goes from that position to more flexed, or less. Either way involves some kind of active motion. So mine (and most other vibratos I have observed) works the second way.